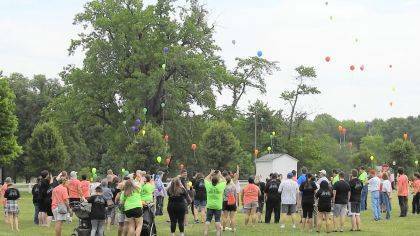 Biodegradable balloons were launched at the 19th Annual Mental Health Awareness Walk on May 26 in West Liberty. 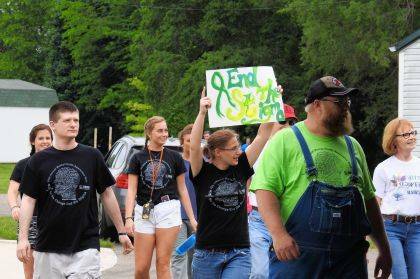 Mental health advocates walk to end the stigma during the event on May 26 in West Liberty. WEST LIBERTY – The National Alliance on Mental Illness (NAMI) of Logan and Champaign Counties hosted its 19th annual Mental Health Awareness Walk on Saturday, May 26. The event was held at Lions Park due to its central location between the two counties. It was a cooperative effort with Recovery Zone during the month of May, which is Mental Health Awareness Month. NAMI advocate Pete Floyd, Urbana Mayor Bill Bean and Champaign County Commissioner Steve Hess spoke during the event. The goal of the awareness walk was “Pulling together as a community to fight stigma and gain a greater understanding of mental health conditions,” according to organizers. A biodegradable balloon launch was also part of the activities. Participants paid to register for the walk and wore special t-shirts in the hopes of ending the stigma associated with mental illness.